I attended the Crystal city council meeting on April 1, 2014. It was a short one, wrapping up by about 7:30. The meeting convened, and then immediately recessed so a meeting of the Local Board of Appeal and Equalization (BAE) could convene. The BAE is really just the City Council, so the convening/recessing was a technicality required by the law. The point of the BAE meeting was to allow citizens a method to appeal the valuation of their property. Residents were recently mailed property valuation notices. All in all, 5 property owners came forward to appeal their valuations. One man said he was looking at a 24% increase in his value. The valuations are important because property taxes are calculated using them. The BAE listened to the property owners, and then asked the county assessor to review the valuations in more detail and report back at the next meeting, which will be in a few weeks. The BAE meeting adjourned, and then the council meeting reconvened. 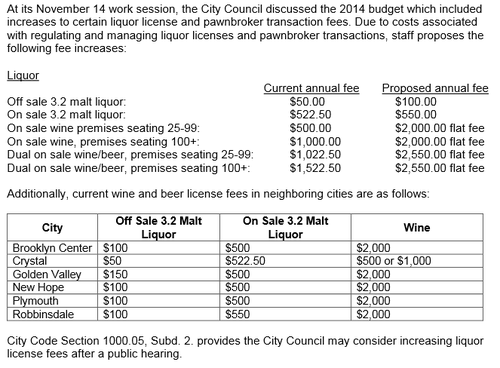 There was a public forum on the agenda to discuss new liquor license fees, but it was tabled because there was a question about if notice was delivered properly. The council then considered a motion awarding the contract for a $200,000 remodel of the council chambers. Apparently the project was sent to multiple vendors, but only one vendor bid on each phase of the project, so the bids were awarded to that vendor. This strikes me as odd. We also found out that apparently the remodel will allow a council member to Skype in to council meetings. I really don’t know why this is necessary, or was included in the project. It was a last minute addition that put the project slightly over budget. Finally, the council passed a resolution establishing the election dates and offices to be considered during the 2014 election. After the meeting, the council went into a closed work session to discuss pending litigation. The first city council meeting of the year was quite a bit less exciting than the last one of 2013. However, the council did cover a lot of ground. The meeting started with the presentation of some awards for the Crystal Sparkles contest. The contest is an annual effort to encourage residents and business owners to decorate their homes and businesses during the holiday season, and is sponsored by the West Metro Fire Auxiliary. There is a cash prize for the winner, though I didn’t notice how much. Here’s the flyer for 2013. During open forum a gentleman told the council about a nonprofit he is starting, called The Light of Crystal, which is designed to promote the city. They have a Facebook group you can join, here. The idea is modeled on a similar program in Robbinsdale called The Heart of Robbinsdale. The group will host social events in the city, including a monthly happy hour. There was also a friendly bowling challenge made by the Mayor of Robbinsdale, Reagan Murphy, to Crystal Mayor Jim Adams at the Crystal group’s upcoming bowling challenge. Next the council appointed its new representative to the West Metro Fire Rescue District Board. The new member is a citizen, not a member of the council, which represents a win for Mayor Adams. Adams has been a strong advocate of appointing a citizen, as opposed to a council member, but had faced opposition from some members of the council. The Human Rights Commission and Environmental Quality Commission both got new members as well. Next the council considered a resolution authorizing the first steps toward exercising their eminent domain authority to acquire property for a new public works facility. I am not crazy about this project- mostly because the cost seems very high. I’m not convinced we are getting the best deal we can get. I also felt that some members of the city staff overstepped the bounds in trying to get the result they wanted from the council. Nevertheless, the city needs a new public works building, and as Crystal is fully developed, it has to go somewhere, which means acquiring land. The owners of three of the four properties that must be acquired are dealing with the city. The fourth just has not responded to the city, which is what lead to this motion. Next the council re-appointed Anne Norris as city manager, and renewed her employment contract for one year. The unanimous vote on this item was significant, as members of CUAPB (see last meeting) have been agitating to get Norris fired. The fact that the renewal of Norris’ contract was entirely non-controversial may be a sign that whatever sympathy or support CUAPB may have had on the council is waning. The oddest portion of the night came when the council voted on the appointments of the commission liaisons. The council appoints one member to be the liaison to each of the commissions: Planning, Parks, EQC and Human Rights. Mayor Adams read the list of proposed liaisons, which had council member Joe Selton assigned to the Human Rights Commission. Selton objected, and asked to be switched to Environmental Quality instead. Selton did not give a reason for the switch, but it was accommodated.